Windows 10 has the ability to manage work groups which makes it a great operating system than others. As Mac doesn’t try that much to compete against, which gives the edge to Microsoft that is why most businesses use windows operating system. In organizations with the complex hierarchal structure, the administrators manage groups from the Local Group Policy Editor with Windows with ease, and Mac doesn’t have anything to compete that, Microsoft has even made it easy to manage the employees who do use Mac machines that are networked in the same Windows environment. Windows 10 also offers groups for sharing resources like Scanners, Printers. The group is in a workplace or school, then it is called a domain. If the group is part of a home network then, it is called a workgroup or home group. Sometimes you would want to change workgroups like when working with older operating systems in your house which can’t detect your system etcetera. Whatever the reason is, this article will help you to change the name of your workgroup. Before performing this activity, you’ll surely be interested in looking out how to locate the workgroup information on your home network. There are a couple of ways you can check the workgroup information. Search the workgroup from Control Panel, go to the search field in the task-bar and type “Control Panel.” Then click on the “System” link from the Control Panel Items. Or with the right mouse button click the Start icon and choose System. 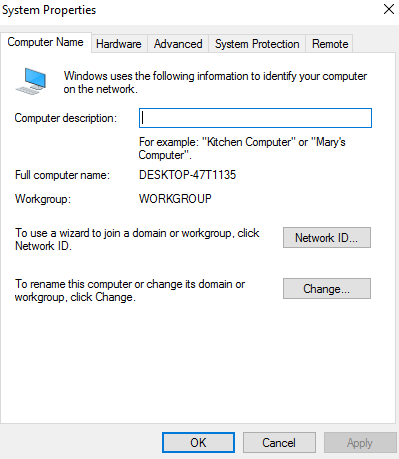 Under “Computer name, domain, and workgroup settings” click on Change Settings. It will open up the system properties windows console. Now click on the “Computer Name” tab available at the top and then again click on the “Change” button. From within the Domain Changes dialog box, look for the “Workgroup” section at the bottom. 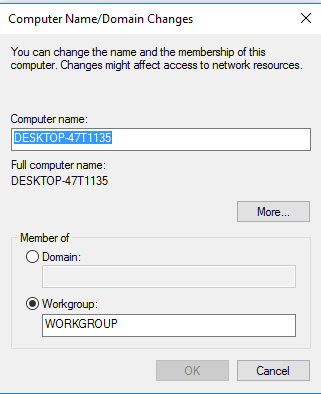 Erase the current workgroup’s name to replace it with the new name. Once you have entered the new workgroup name, click on the “OK”. Reboot your computer when done. That’s it.